Janine is in a hurry this morning. Today is her biology exam in school. And she is already late! She studied the whole night and is really nervous. And the snowy streets also don't help. Janine tries to drive on the slippery narrow streets as fast as her old Fiat would allow. When the small street starts to wind uphill, she slides on the slippery ground into the deeper snow at the edge. 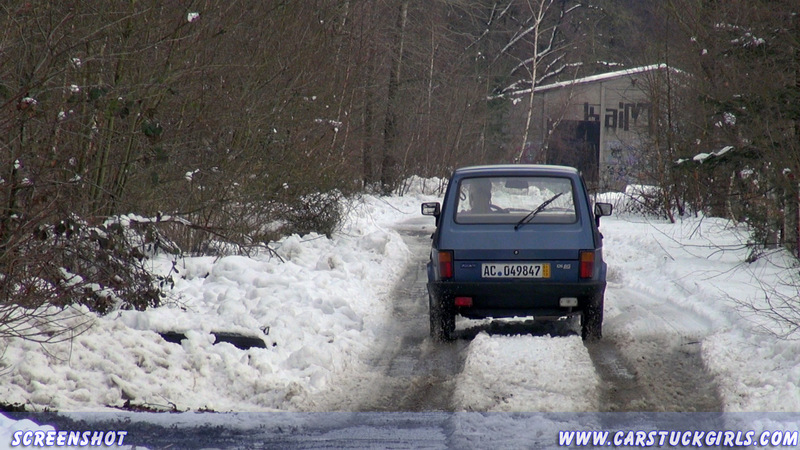 The Fiat is struggeling to drive uphill and the tires start spinning in the deeper snow. Damn. This is not good. Janine will lose precious time for her exam. 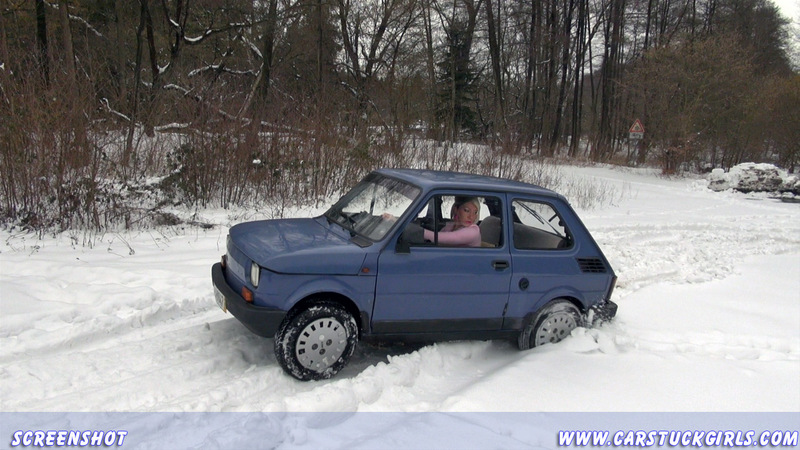 She keeps accelerating and the Fiat moves slowly back and forth through the snow (lots of car movement)... Oh no. She is stuck in the snow! Janine gets more and more nervous and stalls the car several times. After she stalled the engine once again, she steps out to have a look. Wow. The snow is really deep here and the street is going uphill. Damn. That doesn't look good. Let's keep trying. She needs to get to her exam! And she forces her Fiat again forward and backward through the snow, slowly rocking its way out ... But now the stalling get even worse. Something must be wrong with the engine. It has lost all his small power and keeps stalling. And Janine has trouble to start it again (cranking) ... Now Janine is double-stuck. Not only stuck in snow, but now even without snow, her car won't move again ... (lots of pedal pumping). - serious car trouble !! !